You don’t have to be a kid to be awed by the Volcano Slide at Lydgate Park’s Kamalani Playground. Or by the multicolored mosaics—turtle tables and snake seats and tiles shaped into the faces of divers and butterflies and fish. A lot of love went into creating what the Friends of Kamalani and Lydgate Park like to call the “best beach park in the state of Hawaiʻi.” And love is what keeps it looking spectacular. For more information, contact Thomas Noyes, ThomasNoyes@hawaiiantel.net, (808) 639-1018, or visit www.kamalani.org. And if you’re on Kauaʻi for Earth Day, April 17 this year, help the Friends celebrate on their major volunteer day of the year—lunch is included! Throughout March, we’ll be featuring a variety volunteer projects available on Kauaʻi’s east and north shores—check back here for weekly updates. 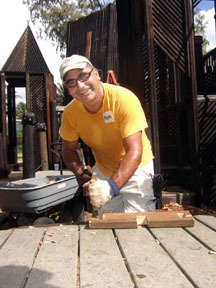 Applying non-toxic linseed oil sealer to Kamalani Kai Bridge and Kamalani Playground is a recurring volunteer activity. 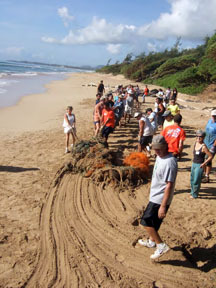 Dragging a net ball off Wailua Beach on Earth Day 2009. Volunteers also maintain the 16-year-old Kamalani Playground. « How Clean Is Your Ocean?